Evolution has ExtraordinAir looper threading, LED lighting, differential feed, cover stitch, thread cutter, foot control, threading chart. Baby Lock BLE8W-2 Evolution 8/7/6/5/4/3/2-Thread 3-Needle Serger. Baby Lock Evolution Key Features. Three LED lights bring new clarity to serged stitches. Pure Lighting with 3 LED lights. 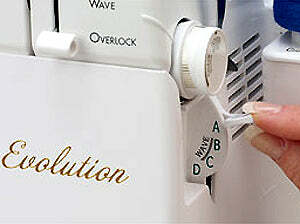 Exclusive Wave Stitch and Reverse Wave Stitch for additional stitch options. 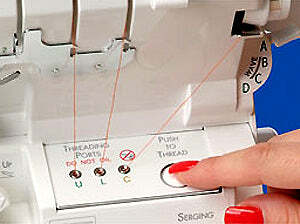 Serging options from 2 to 8 threads. Chain/cover stitch functions include single, double and triple cover stitch. 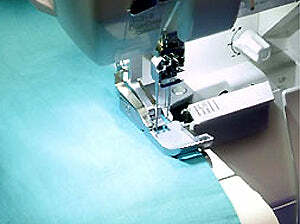 Overlock stitch functions to seam and encase fabric edges. 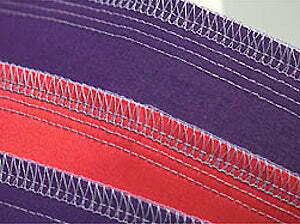 Flatlock stitch functions for seaming or decorative effects. 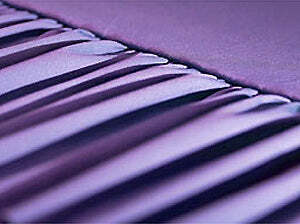 Heavy duty cutting system handles thick fabrics with ease. 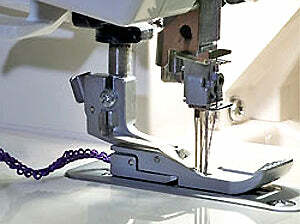 Automatic rolled hem stitch functions create a professional finish. Dial adjustable stitch width: 1.5 - 7.5mm, up to 16mm wide on Expressive stitches. Up to 1,500 stitches per minute.